story by Liz Pacheco | photo by Nato ThompsonThere are so many creative individuals and groups in Philadelphia,” says Theresa Rose, founder of Philly Stake, “but their grassroots organizations have few ways to get funding, especially on a small level.” Rose credits Philly Stake’s success to its ability to fill this unique niche: boosting community-based projects with recurring fundraising events centered around a locally-sourced meal. Philly Stake is based on Sunday Soup, a model for funding small to medium-sized projects through a community meal. Interested people come together, a meal is sold at a reasonable price, and the proceeds fund a community project. There are more than 40 groups like this around the world, including Milan, Italy and Kiev, Ukraine. After attending Sunday Soup dinners in Chicago and similar FEAST (Funding Emerging Art with Sustainable Tactics) events in Brooklyn, Rose was inspired to bring the micro-granting model to Philadelphia. And while Philly Stake follows the Sunday Soup and FEAST model, the name change is important. With the help of countless volunteers and a grant from the Philadelphia Exhibitions Initiative, part of the Pew Center for Arts and Heritage, Rose had the manpower and capital to hold the first event in September 2010. 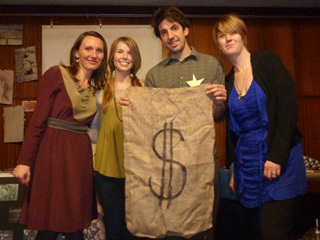 One hundred and fifty guests attended and a $900 project grant was awarded to urban farm group Philly Rooted. The second dinner, held in January, had to turn attendees away at the door. Three grants were awarded: one for $1,000 to Refugee Urban Farm and two for $400 to the Recycled Artist-in-Residency Program and Warrior Writers. The third Stake, planned for July 17, is expected to be even larger. Historic Bartram’s Garden has donated use of their outdoor space to host a picnic supper. In June, a call for creative project proposals was made. At the July dinner, 10 will be presented and attendees will vote on their choices; the winner or winners of the evening will leave that night with their micro-grant. Past proposals have included urban farming, line dancing for breast cancer awareness, beekeeping and creative writing workshops, among others. “We had never done anything quite like [Philly Stake],” said Fern Gookin, of the Recycled Artist-In-Residency Program (RAIR), which received a $400 grant at the second dinner. Compared with written grants, Gookin said their Philly Stake proposal really allowed their passion for RAIR to come through. For more information about Philly Stake, past project proposals, and how to volunteer visit phillystake.org. The July 17 dinner was held at Bartram’s Garden.